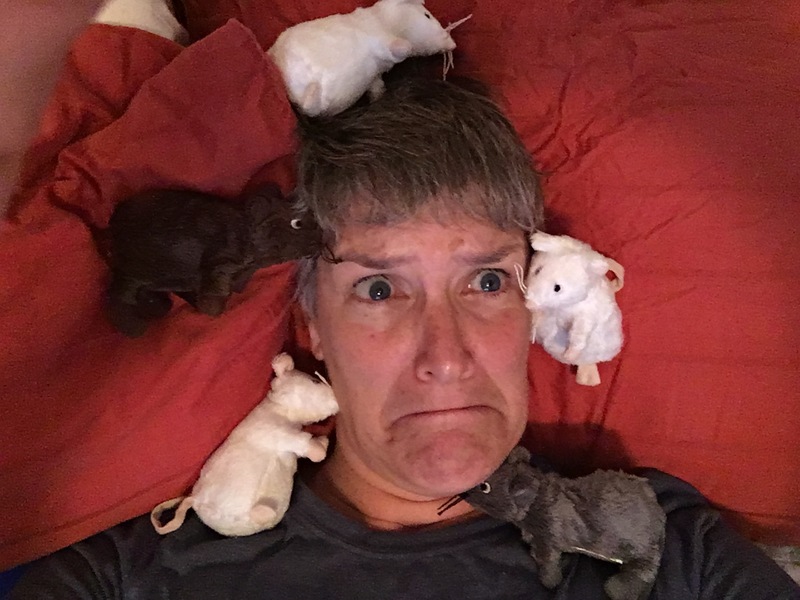 I’ve written about my song, “Brain Rats,” in this blog several years ago. Now I’m revisiting the subject in celebration of the new music video of the song. Much to my surprise, the song is one of my most popular. I think it’s because “Brain Rats” brings our secret worries out into public and make ridiculous fun of them. The idea for this video began a few years ago when my friend, Christopher, gave me two stuffed rat toys. They took up residence on my piano and encouraged my voice clients to acknowledge and move past their own brain rats as they opened up their voices. Those rats also traveled with me wherever I went, residing in a special pocket in my backpack. I’d bring them out whenever I did the song during a keynote or training. Chris recently added to my rat collection. He sent a brown paper package wrapped in yards of tape. When I slit it open, nine more rats popped out and scattered across my dining room table. That’s when I got serious about bringing the video to life. I contact my brilliant young videographer, Isaiah Bischoff, who helped me create the “Man Alive” video last year. One of the big questions was what to wear in the video. I was still unsure about it when Isaiah showed up at my house on the day of the shoot. As I talked with him about options, I finally got the answer: my grandfather’s vaudeville costume. Back when we were clearing out my singing grandpa’s house in Des Moines, Iowa, I found two identical lavender and light green suits. He wore one of them when he performed vaudeville around Iowa as a young man in the 1920’s. I also have one of the tambourines he used in those performances with the jokes taped inside. Amazingly, one of the suits fit me perfectly. At 6’2” I rarely find anythingfits that well, let alone something that antiquated. The suits have resided in my closet ever since. I love having them around, but I rarely find an opportunity to wear them. Many years ago, a friend and I wore them for Halloween. I’ve pulled out the jacket for a performance here and there. It made me happy to bring something of my grandfather’s spirit into this project. I imagine he would have enjoyed adding some beautiful baritone harmony to the song. He sang beautifully his whole life long. I also enjoyed the long arc of time reflected in the project….my grandfather who was born in 1900, my middle-aged self and Isaiah who turned 16 a few weeks before the video shoot. Now the video is out there in the world, bringing the message of “Brain Rats” to a wider audience. 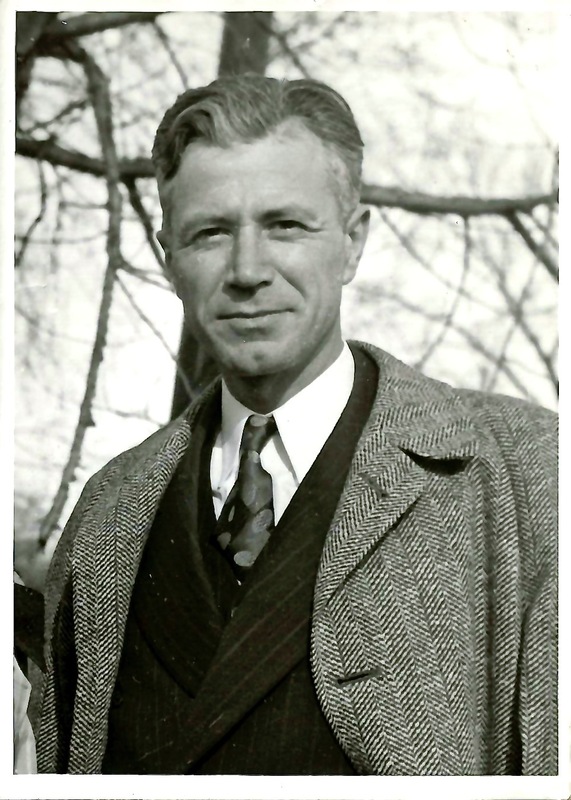 And at the tail end, there is my handsome Grandpa Fred’s face smiling out from the past. You can watch the video here….and feel free to spread it far and wide! This entry was posted in Humor, Uncategorized and tagged Brain Rats, grandfather, Isaiah Bischoff, legacy, vaudeville. Bookmark the permalink. Admiring you as well, dear one!